Bert Llanes was fishing with his daughter Amanda (in red shirt) and Ricky Beltz at their secret spot near Milolii on the Big Island when he hooked his 110.5-lb white ulua. Bert, Amanda and Ricky were entered in the Ohana Fishing Tournament at the time and Bert's fish took first place honors. The previous year, Amanda won the Teen Division with a 42-lb kaku and Bert won second in the Men's Division with a 57.5-pounder. 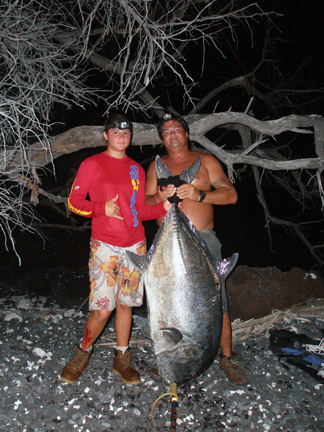 Bert scored his 110-lb ulua using a Slider pole, Penn 6/0 reel and 100-lb test Shogun line.